This entry was posted on Samstag, Januar 29th, 2005 at 00:00	and is filed under black and white, gallery, people. You can follow any responses to this entry through the RSS 2.0 feed. You can leave a response, or trackback from your own site. 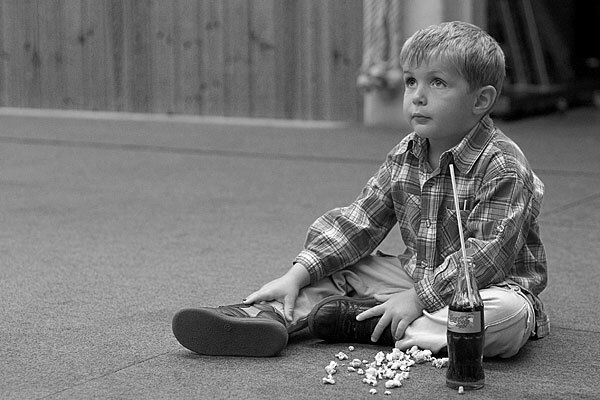 A very quiet image – disturbing though as he looks as though he is watching a movie? And where is the popcorn box. I like the composition. This is so cute! The boy is extremely endearing. Wonderful portrait. That popcorn on the ground is a nice detail, and the look on his face is perfect.